As a general rule the French felt that the best way to disable an enemy ship was to destroy his means of manoeuvering. They therefore concentrated their fire on the masts and rigging, launching their broadsides on the upward roll of their ships. This fire policy often crippled the British ships, preventing them from pressing home their attack, but was less deadly to the crew. The British used the opposite tactic firing on the down roll into the enemy hulls, causing a storm of flying splinters that killed and maimed the enemy gun crews. These tactics were accentuated by the fact that the British tended to chose the weather gauge and the French the lee, so the tendancy was for the French guns to be pointing high and the British low as their ships heeled in the wind. Although only a very general rule this contrast in tactics goes some way to explaining the difference in casualty figures between the British and enemy sailors. The British percentage of killed to total casualties was just over 25%, i.e. three wounded for every one killed. But for the enemy the percentage was 55%, i.e. for every four wounded five were killed. The speed with which the guns were loaded and fired by the Royal Navy gun crews was also higher than the French and Spanish, also a factor in the higher casualty figures for the enemy fleets. The destruction of the enemy ship by gunfire was one of three elements that could lead to death in battle; the other two were fire, and the sea. 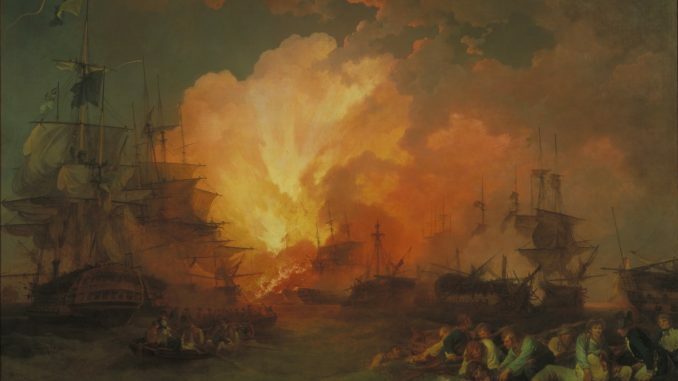 No British ship was sunk or burnt in any of the great battles, in fact only 8 ships of the line were burnt or blown up throughout the whole war, 17 were wrecked and 3 foundered. The French suffered some major tragedies, such as the Orient at the Battle of The Nile and the Indomitable at Trafalgar, which lost 1250 men from a crew and troops numbering 1400. 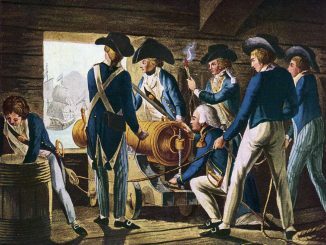 To put the French losses in perspective we can look at the casualty figures suffered by the British Navy in the American War of 1812. Here the British ships came up against well trained and perhaps better motivated seaman than any of the other navies they were engaged against. 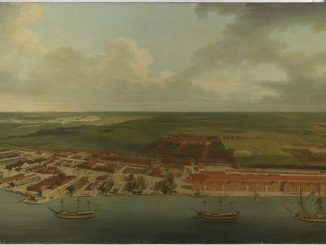 The Americans trained with live ammunition more often than their British counterparts; the British, spending long periods at sea, tended to reserve their supplies of powder and shot for actual engagements. They also signed on for a set number of years, as opposed to the British who were signed on indefinitely, and they were paid as well or better than a skilled workman could earn ashore. 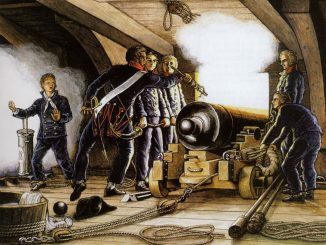 They aimed their guns directly into the enemy ships like the British, as well as at the masts. When the USS Constitution with a crew of 456 defeated HMS Guerrierre, crew 302, The Constitution suffered 14 casualties to the Guerrierre’s 78. The American Frigates fired faster and more accurately than the British thanks to training, the use of a new powder charge encased in lead not cloth, (no need to swab out the gun), and gunsights, an innovation not utilised by the British. Till this point the British captains had relied on getting their ships close to the enemies, a tactic that meant rate of fire was more important than accuracy at longer ranges. The odds were in favour of the larger Amercan ships in the ship to ship engagements that happened during the War of 1812, but the British were used to taking on larger opponents and it must have been a shock to the Admiralty to start losing such engagements so comprehensively.